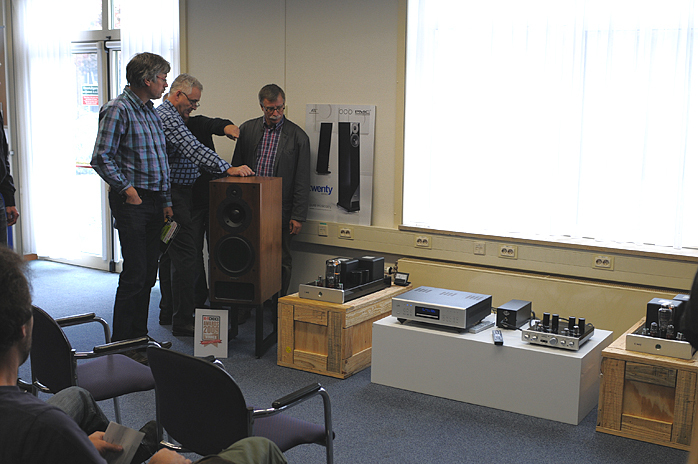 Distributor X-Fi organized the third edition of an annual audio event now under its own name on the last weekend of September 2012. Previous editions had been side-show affairs, i.e. they had piggybacked on shows organized by the ‘official’ association of Dutch audio distributors. Such piggybacking by a bunch of what many viewed as young rascals was not always received with open arms. The reasons are obvious. It's all about prestige and money. Side shows always seek venues which offer rooms for less and their organization is often more flexible - yet without glomming on to the main event’s traffic they wouldn’t exist. In the golden days of the Las Vegas CES when the high-end audio exhibits were located in the Alexis Park hotel, the neighboring St. Tropez housed the alternate T.H.E Show which literally offered more bang for the buck. That show too made use of the name and fame of an established event to poach its visitors. But back to Holland. For many reasons—the effects of the financial crisis not being the least—the formal Dutch audio distributor’s show had no 2012 edition. That's when X-Fi decided to step up and in. 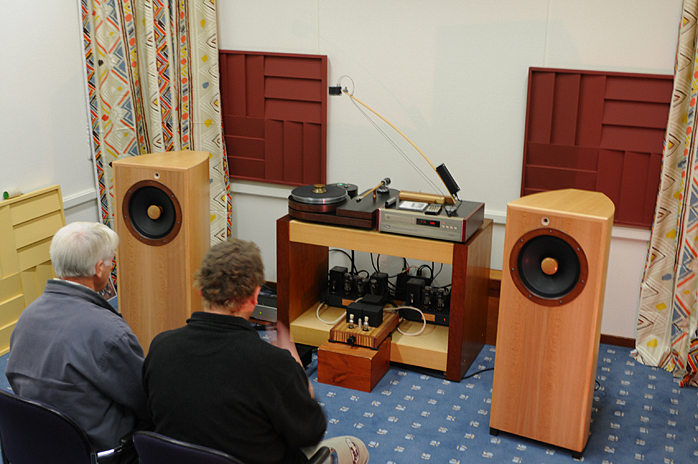 Their focus was on a venue with a long rich history of hosting hifi shows: the former monastery of Veldhoven. Though a pretty maze in how it’s laid out, it offers plenty of rooms of decent size, fair soundproofing, workable electricity (with some quirks), a bar, a restaurant and ample parking. The ‘young rascals’ lead by Caspar Bunge managed to rouse over 50 distributors to be enthusiastic for the event and join. With moderate room rates teaming up didn’t break the bank. That was one side of the medallion. The other of course was the unknowable. Would there be sufficient attendees? Previous X-Fi shows had been cozy happenings but attendee numbers for then free admittance not really exciting. How would that concept go over in a bigger more prestigious version for its maiden installment? With hard work to not merely lure even the skeptics amongst distributors but also hard work in the arena of advertising we can say that Caspar and cohorts pulled it off! We visited the show one day and the first thing noticed was that we had to park way back in the parking lot. It was busy! Along the way to the entrance we passed lots of familiar faces and wafting out of smoker’s paradise the conversations on this version of social media were mainly on how great it was to finally be back in Veldhoven for a real show. While doing our rounds through the maze hoping not to miss a room, two things were noticeable. One, it was really busy. Many if not most rooms were very hard to get in as lines were queued up in the hallway. Once inside a room, all chairs were taken and many requests played. From the exhibitors’ side we heard no complaints. Neither about the organization nor the number of attendees. Minor problems like stuck windows or recalcitrant power outlets were all sorted in time by the venue’s technical staff. Hence the general mood was festive and interested. We tried to visit all rooms but there is a chance we missed one or two. Next year—yes, Caspar is already planning—a proper guide will make navigation easier. Here follows our selection of rooms or products that stood out to us in some way or another. Audiomaat played music with Transmission Audio M1i loudspeakers, AudioZone Amp1, CEC tl 51X, Metrum Octave, Eastern Electric MiniMax Pre including a Peter van Willenswaard modification and Peter’s DAC, Acoustic Revive Rio MKii-RD3, Acoustic System International tweaks, M-cords cables and M-bag accessories. 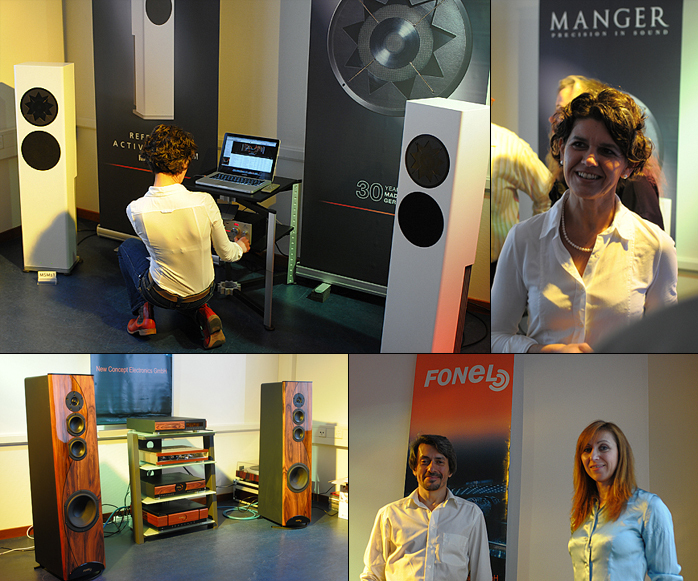 We have to admit that we had previously not heard the M1i speakers like this, i.e. without what for us is too much presence of the metallic ribbon tweeter. 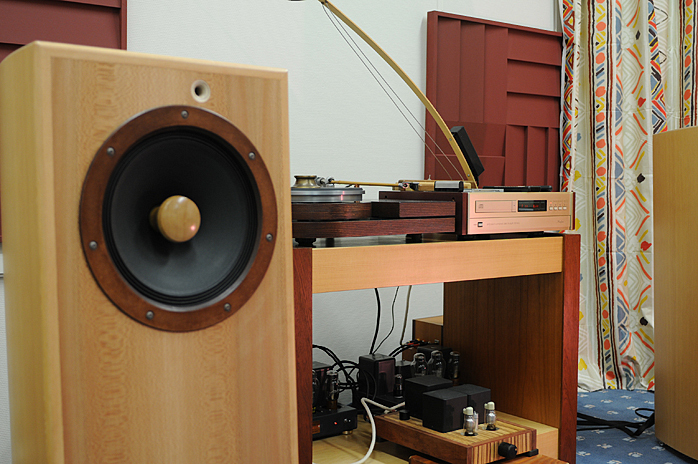 Musical Affairs demonstrated their loudspeaker designs based on French EMS Fertin field-coil widebanders together by Sun Audio and Pel amplifiers. The turntable was a design by Frans van Dam sporting a bamboo arm. New also were the EMS field-coil based open baffle loudspeakers called the Mini. 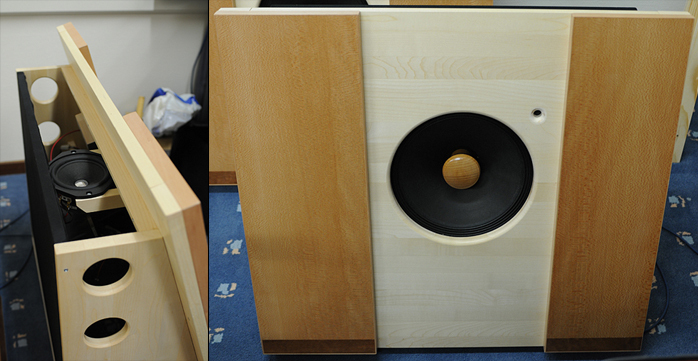 In addition to the 30cm woofer a midband driver is on duty under the top cover. The treble is handled by a small tweeter in the baffle. 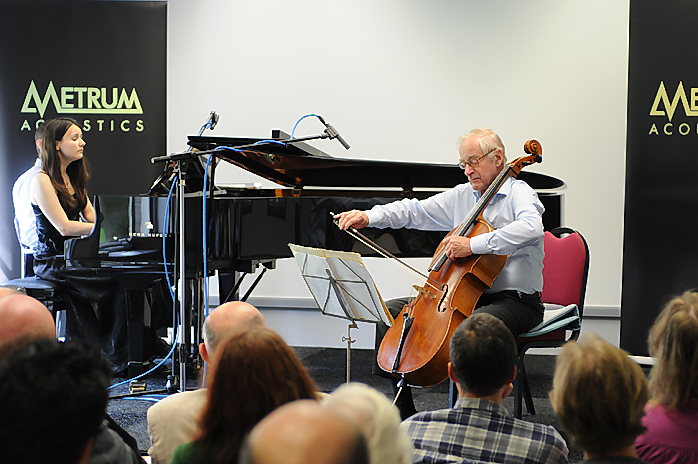 Musical Affair’s Hans Kortenbach claims inspiration for this design by Wharfedale’s Gilbert Briggs. 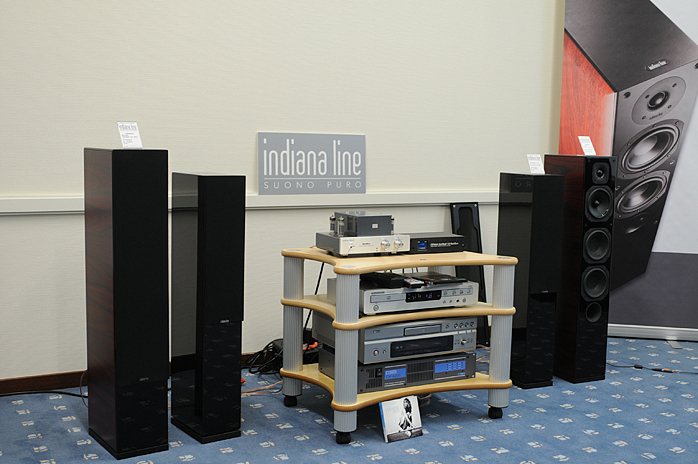 Indiana Line is a loudspeaker manufacturer who combines good Italian design with almost un-Italian prices. The setup was a combination of very affordable gear like a MiniMax preamp and surprisingly a Cloud CX-A200 4-channel amplifier no longer available. For those on a budget this line of speakers is definitely one to keep in mind. 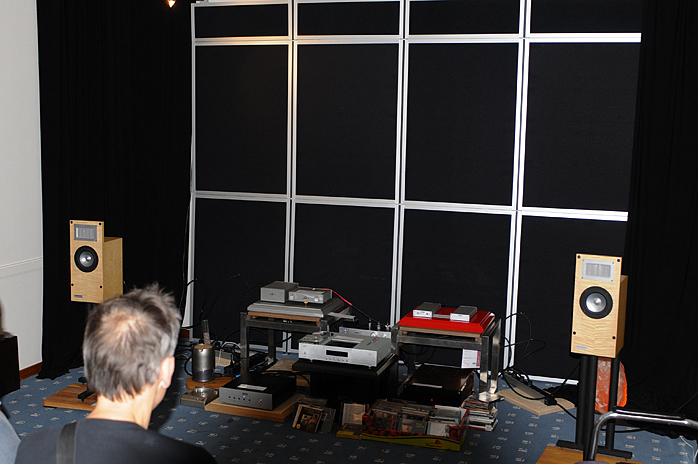 Stage Acoustics is the Dutch distributor for PMC. PMC is famous for its transmission-line loaded professional loudspeakers but uses this technique as successfully in a more domestic line. In the room was a big pro rig trying to blow out the windows now and then plus a more tender setup playing with IB1 speakers and Cary amplification. Ceelen Techniek is distributing Manger products. For the show Daniela Manger had come over from Germany to explain the workings of her driver—not an easy task to perform or follow—and to answer many questions between playing music. The same room also housed a German brand new to our Dutch market, Fonel. A number of reviews on their products can be found in these pages as syndicated by our colleagues at Fairaudio. Fonel’s Sergey Buchakchiysky and Olga Ehms were present to demonstrate and field questions.